Since 1994, the Austin Poetry Slam has produced and nurtured the premier talent in the Slam Poetry world. Finishing as one of the top ranked Poetry Slam Teams in the world in the 2018 National Poetry Slam, Austin continues to be the paramount example of this dynamic art form. Once again it is time for us to crown a brand new champion, a Slayer of Slam, the best Weaver of Words. Over 400 poets have competed at the Austin Poetry Slam, but only the Top 10 poets in Austin will competing for this coveted crown! 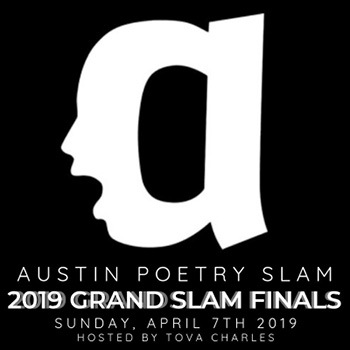 Who will be the 2019 Austin Poetry Slam Grand Slam Champion? Who will take home $1000 in cash prizes? Come join us and witness the greatness!